The best part about Halloween is the candy, hands down. My absolute favorite has always been the peanut butter cup and this year I wanted to try making one that was free of all the refined, processed stuff. I was surprised to find that they can be easily whittled down to five simple ingredients: chocolate, peanut butter, coconut oil, salt and vanilla. Yes, that’s it! They are also ridiculously easy to make, the only hard part is waiting for them to firm up in the freezer. This recipe makes approximately 12 mini cups but could be easily doubled…or tripled. Let’s get real. Makes approximately 12 mini cups. Melt the chocolate chips over a double boiler or in the microwave for a minute or two, checking and stirring often. Line a mini muffin tin with paper cups and spoon a small amount of chocolate in the bottom. Use a spoon to make a small well and transfer to the freezer to harden for 10 minutes. In the meantime, combine the peanut butter, coconut oil and vanilla in a small bowl until smooth. 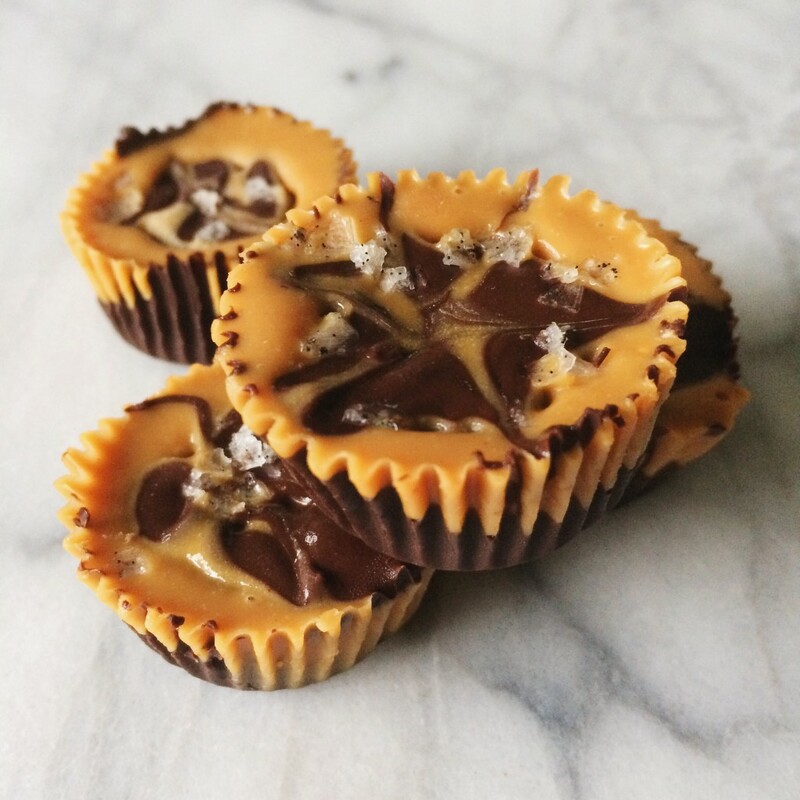 Remove the hardened chocolate cups from the freezer and spoon a teaspoon or so of peanut butter into each cup. Top with the remaining chocolate and use a toothpick to drag the chocolate into the peanut butter (kind of looks like a spider web, we are festive over here). Sprinkle a little salt on the top and pop them back in the freezer for a couple hours to firm up. Let the cups sit out for 10 minutes or so before eating for the perfect melt in your mouth texture. Happy Halloween! These were scrumptious! Thanks for sharing the recipe!